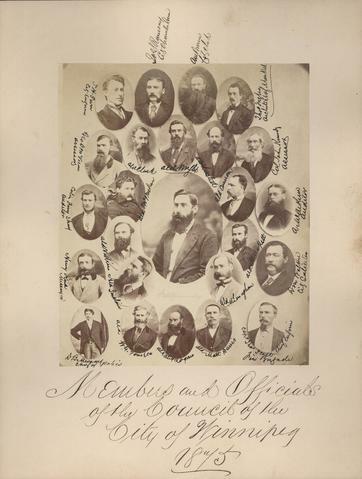 Photograph shows William Nassau Kennedy, Mayor, Alderman John Cameron, Alderman Willoughby Clark, Alderman Matthew Davis, Alderman William Gomez Fonseca, Alderman John Hacket, Alderman Alexander Logan, Alderman Thomas Lusted, Alderman James McLenaghan, Alderman Alexander McMicken, Alderman Dugald Sinclair, Alderman Archibald Wright. D.B. Murray, Chief of Police, Capt. Thomas Scott, Chief Engineer, Fire Brigade, D.M. Walker, City Solicitor, A. MacArthur, Auditor, Col. John Kennedy, Assessor, Thomas Inglis, Architect of Market, A.M. Brown, City Clerk, James S. Ramsay, City Chamberlain, T.H. Parr, City Engineer, G.D. McVicar, Assessor, Colin F. Strang, Auditor, Henry Kirk, Messenger.